As violence in the Gaza Strip is once again flaring up reportedly following a raid and bombings by Israeli forces and multiple rocket launches from inside the Palestinian enclave, the United Nations Secretary-General, António Guterres, said on Tuesday that he was following developments closely, while his Special Coordinator for the region, Nickolay Mladenov, works with all sides to try and restore calm. Urging all parties to “exercise maximum restraint,” Guterres noted that efforts to implement a ceasefire are ongoing in close collaboration with the Egyptian authorities, the main interlocutor between the Israeli Government and the Hamas extremist group, which has been controlling Gaza since 2006. According to media reports, the latest violence erupted on Sunday evening when an Israeli special forces operation was exposed by troops several miles into the Strip that resulted in the death of at least six Palestinians. The Hamas forces reportedly responded with hundreds of rocket launches across the border, and Israeli forces continued the escalation by bombing several sites, including the Hamas-run television station Al-Aqsa TV. A Palestinian from the occupied West Bank working in the southern Israeli city of Ashkelon was also reportedly killed by rocket fire. The group controlling the Gaza Strip has reportedly pledged to step up rockets attacks “if Israel continued its aggression”, further derailing the painstaking truce-efforts that have been ongoing for months now, led by the UN and Egypt. 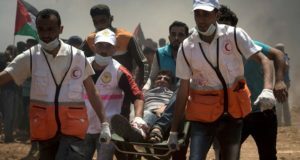 The situation in the Gaza Strip has been extremely volatile since March when demonstrations started at the border fence to protest against Israel’s longstanding blockade and the deteriorating living conditions in Gaza. Over 150 Palestinians have been killed by the Israeli security forces and more than 10,000 demonstrators have been wounded; half of them by live fire. Written by: KanelkaTagba on November 14, 2018. Posted by KanelkaTagba on Nov 14 2018. Filed under Headlines, World News. You can follow any responses to this entry through the RSS 2.0. Both comments and pings are currently closed.